The Wintouch K72 Kid Tablet makes a wonderful gift for a family with a toddler. 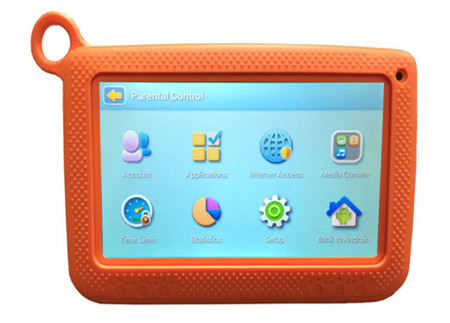 Large, bright, and colorful icons feature on this Android 4.2 tablet, making it easy for a child to navigate the menu. The large and bright 7inch touchscreen of this tablet is capable of ten point input support. A Quad-core RK3126 processor, along with 8GB of internal storage and 512MB of RAM, powers this tablet. A WiFi make it easy to wirelessly connect this tablet to different devices. 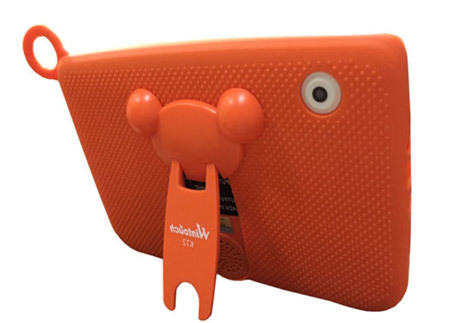 The snazzy orange color of this tablet gives it a happy go lucky attitude. This tablet by Wintouch features a 7inch 1024 x 600 pixel capacitive touchscreen display. This touchscreen is capable of responding to up to ten touch inputs at the same time. This tablet has a wide bezel, which makes it very usable and easily portable for a toddler. 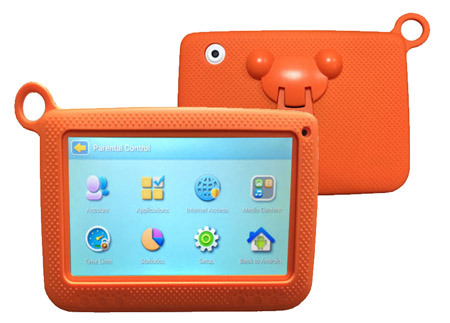 The Wintouch K72 Kid’s Tablet runs on the Android OS 4.2 developed by Google. A Quad Core processor, clocked at 1.2GHz, powers this tablet. This tablet features 512MB worth of RAM, easily running different applications at the same time. High quality hardware ably supports the Android OS, letting your child enjoy featured functionality and performance. This Android tablet can easily play most standard media files as it supports a wide range of audio and video formats. This tablet features a 0.3 megapixel camera at the front and a 0.3 megapixel camera at the back, which enables you to capture pictures as well as engage in video calling. In addition, this Wintouch tablet includes support for English, French, and Arabic among other languages. 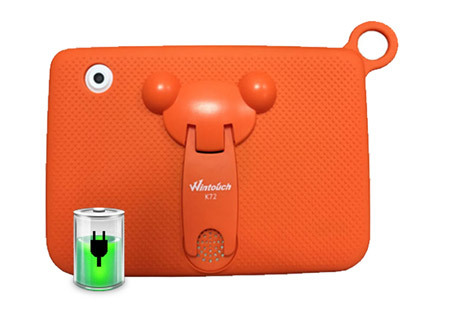 The K72 Kid’s Tablet by Wintouch features a WiFi adaptor that facilitates easy connection to the Internet. A 3.5mm audio jack is also present at the bottom, enabling easy connectivity of audio peripherals. This tablet features a 2500mAh battery that facilitates long time usage by a child. An 8GB memory module comes outfitted in this tablet, enabling easy storage of different files. The storage capacity of this tablet can be extended by up to 32GB with the use of an appropriate memory card.